Free Australia screensaver download includes animated Australian flag and desktop wallpaper. 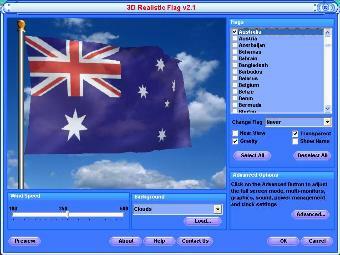 The 3D flags screensaver is compatible with Microsoft Windows 7, Windows Vista and Windows XP desktop themes. Feel free to express your patriotism with a proudly flying Australian flag on desktop background. 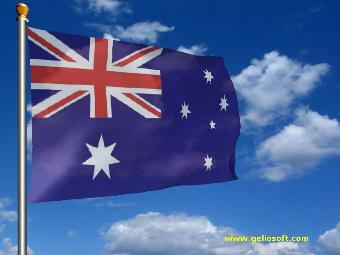 3D Australian flag waves on the wind in 3D Realistic Flag Screensaver. If you want to animate your Windows background with moving flag of Australia, just download 3D Realistic Flag Screensaver and install the full version. In the settings of the flag screensaver, click on the Australian flag name check-box and now your computer screen has been decorated in support of Australia Day celebrations. If you want to decorate your computer desktop with a moving Australian flag 3D wallpaper, just right-click on the image above and select "Set As Wallpaper" from the drop-down menu.